ARE YOUR READY TO VOTE? Over the past few months, our door-to-door organizers have knocked on tens of thousands of doors in our communities, talking about the issues that affect working families. 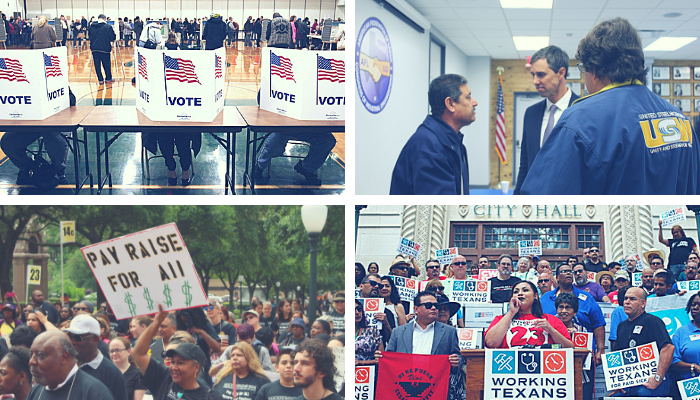 And all across Texas, working people are coming together to change policies in our state and to build power for each other by putting working families’ issues front and center. We’ve hosted community town hall meetings, neighborhood legislative advocacy trainings, and had thousands of one-on-one conversations. We know that working families want higher wages, equal pay for equal work, access to paid sick days, more affordable college, better neighborhood public schools, more job training programs, and access to health care for all. Now, elections for the future of our state and country are only days away, and your vote can make a difference. CLICK HERE to find out about key elections in your area, which candidates are fighting for working families and information about when, where, and how to vote. The most important election of our lives is only days away. It’s time for working people to fight back.